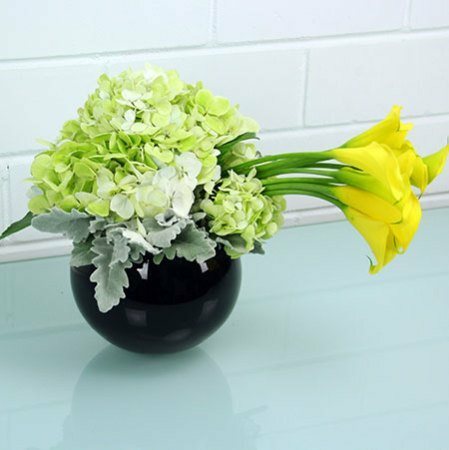 This rounded low flower arrangement in a stylish black fish bowl vase looks great on a coffee table in an office waiting room or reception desk. While the blooms change from season to season, the overall look and design style of these office flowers remain the same. Our florists will also customise these blooms to match your office decor - simply give our team a call on 1800 66 66 46 or email us at sales@flowersforeveryone.com.au. *Please note: Flowers for Everyone delivery weekly corporate flowers to offices throughout the Sydney metro. The pictured flower arrangement is a guideline only, but the exact flowers may not be available at the time of your order. We highly recommend giving us a call to discuss your office flowers so we can create a design that fits your requirements and budget.